Description: Smaller than a robin, Wilson’s Phalaropes are sexually dimorphic in both size and plumage. Females sport a black neck stripe, orange foreneck and breast, plain gray crown and are chestnut and gray above in breeding plumage. Males are smaller and duller. They are often observed floating in deep water in large groups. Spinning like tops in tight circles to bring food to the surface, they use long, slender, needle-like bills to pick invertebrates out of the water column. In nonbreeding plumage, both sexes are basic gray above and white below with plain wings and a white tail showing in flight. Similar Species: Wilson’s Phalaropes can be confused with Red-necked Phalaropes. 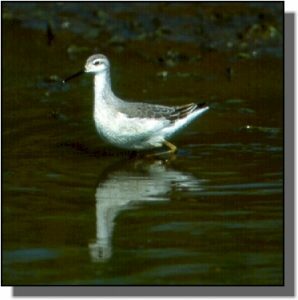 Look for the prominent gray crown and tricolored pattern of the Wilson’s Phalarope during the breeding season. They lack the black eye spot in nonbreeding plumage. 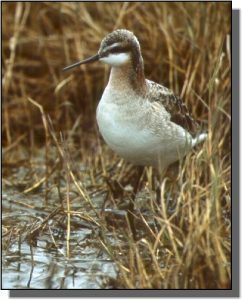 Comments: Phalaropes are polyandrous (females attempt to mate with more than one male). Incubation and chick rearing are done by males. 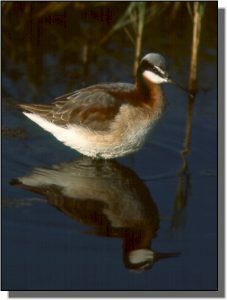 Wilson’s Phalaropes breed throughout wetland areas in the central through northern Great Plains. Large flocks of staging birds are found on saline lakes and marshes in July. Most winter on saline lakes, primarily in mountainous areas of South America.